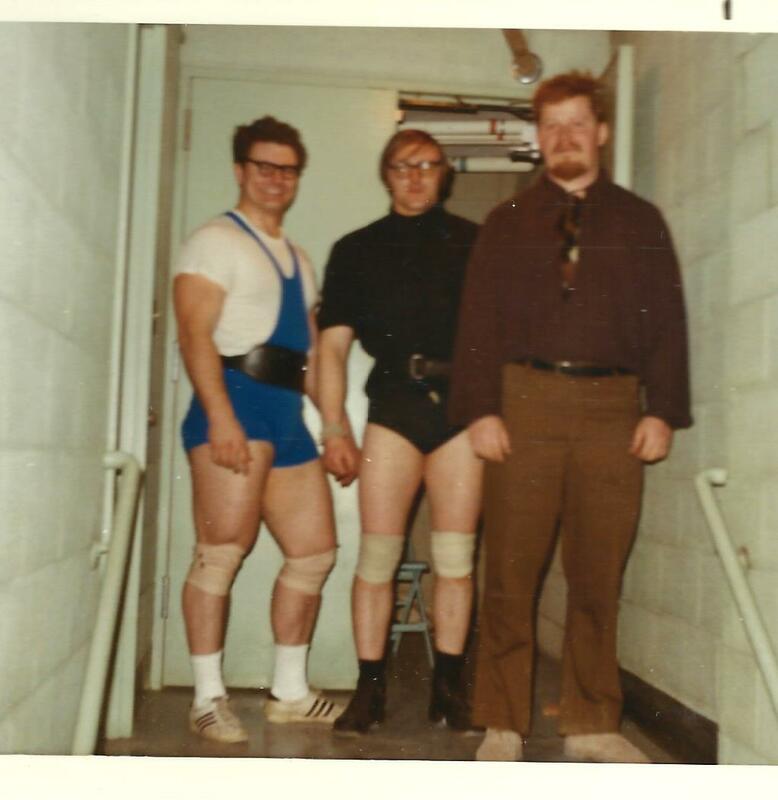 Don Cundy on the right. The thought has occurred to me that some might question my right to give advice on squat training since my own accomplishments in this lift are not exactly legendary! I would be the first to admit that I am only a fairly good squatter, at this time. But the truth is I was really hopeless not so long ago. There are some fortunate enough to be born with natural squatting ability and who are destined to become great squatters, regardless of what training programs they follow. I do not belong to this select category and have had to work hard for whatever progress I have made over the years. It is not difficult to understand why people tend to follow any advice given by the successful powerlifter. They figure that he is the best man to teach since he has put his methods to the test, with success. Now while this might be good thinking in some cases, it is also true that some people are just born great gainers, as I explained above. And the advice they dish out might very well cripple the other lifter's chances. I find harder gainers have had to put much more thought and effort into their training. Most "easy gainers" find things going their way with so little effort on their part that very little attention is paid to the training principles employed. I am passing on my own training principles, the same which helped me increase my best official squat in 1966 (550 lbs.) to 735 in 1969, in the hope that you might find them useful. You might recall that I pointed out, in an earlier article on deadlifting [this article was on John Sanchez's American Powerlift Evolution website when it was still available], the importance of considering the WHOLE training program when setting up a workout schedule. Not only do many exercises involve the same muscles, the lifter's general energy level is also affected. For example, most weightmen know that squats and deadlifts work similar muscle groups, particularly the lower back and hips. Because of this, few experienced lifters would consider doing heavy deadlifts the day after heavy squats or vice versa. The muscles involved need more time to recuperate and in the long run most lifters would make little or no progress from such a badly planned schedule. In an attempt to avoid overly long and taxing workouts, bearing in mind the time required for complete recuperation, many lifters employ split routines so popular with bodybuilders. They perform upper body exercises on one day, and lower body movements the next. Now while it may be true that split training allows the trainee to space and reduce his workouts, it is also a fact that his energy will still be down from the previous day's workout. The result is a tired, lacking-in-drive feeling. although the muscles being worked that day seem rested. Bodybuilders tend to use lighter weights and higher repetitions than powerlifters; they do not drain their overall nervous energy to the same degree. Powerlifters are constantly handling limit and near limit poundages. And that is why bodybuilders are able to make great gains on the split method of training, while powerlifters may not do so well on it. In my experience, and a great majority of the other powerlifters agree with me, trying to lift limit poundages more than once a week, in any particular lift, will retard progress. I find I am unable to lift limit poundages in any one exercise more than once in every eight days. The problem, or rather the answer to the problem, is to devise a squat program that will give maximum results and at the same time have no adverse effect on your bench press and deadlift training! I have found two different programs that work well for me. As you can readily see for yourself, both programs are very similar and #2 is really #1 where Monday's and Wednesday's programs have been combined into a single workout on Wednesday. In both programs the muscles involved in each one of the three powerlifts are worked twice each week, once heavy for low repetitions and once light for fairly high reps [i.e., 6-10 a set]. For the squat in particular I do heavy singles on Wednesday, either before or after heavy deadlifts, alternating every other week. I have found from past experience that if I do heavy deadlifts I cannot do heavy limit squats for about six days afterward, and vice versa. Also, it's obvious that if you do both exercises in the same workout, the one you do first will tire you so that you can't do your very best on the other. To get around this problem, I alternate the squat and deadlift every week so that I go to my absolute limit on each lift every two weeks, and as heavy as I'm able to go on the second lift. An added bonus from doing the squat and deadlift for contest situations, where I so often see men failing or doing poorly on their deadlift attempts because of having been drained on the squat. When doing heavy limit poundages, warmup are extremely important in order to avoid injury and prepare the body for maximum attempts. I usually start with 135, then to to 315, 405, 500, 585, 655, 710, and then a limit attempt. There is no magic number of warmup sets or reps but a general rule of thumb is to do enough reps to warm the muscles thoroughly and space the poundage of successive sets so that you don't have to take too large a jump from warmup to maximum attempt. Following my limit attempt, I generally drop the poundage about 100 lbs. and do as many reps as I can, which usually works out to about five. Saturday is my second squat workout day of the week and, since my legs and back are generally still tired from Wednesday's workout, I concentrate on developing the area just above my knees by doing either narrow stance squats on a block to elevate my heels, or ballet type squats with my toes turned out and back held vertical. Both of these methods of squatting work the knee area heavily, which is my weak point in the squat. Some of you may wonder why I have included so much other material in an article devoted to training the squat. The reason for this is that when planning a training program for any one of the three powerlifts, ALL the other exercises you plan to do must be considered as well so that the various muscle groups get enough rest, and the lifter is able to keep his overall energy level high for heavy maximum attempt workouts. Because the squat and deadlift work many of the same muscle groups it's not necessary to do the large numbers of sets and reps. Exercises should be limited to basic power exercises which work large muscle groups. A lot of specialized exercises beyond the basic ones will only fatigue the lifter and retard his progress. Leave "bombing and blitzing" to the bodybuilders.